Local impresario Captain Rick Dostal, the genius behind Payback Productions, has planned what promises to be a great night of music on Friday, January 26. Rick booked two legendary folk-era performers into the Glynn Archer auditorium at Key West High School on a single bill. 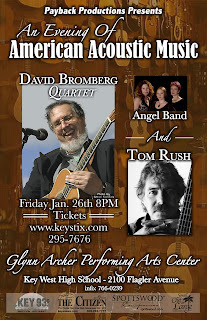 David Bromberg and Tom Rush will share the stage with Bromberg's Quartet and the Angel Band at 8 PM on the 26th for an evening of American Music, classic tunes from several decades and across several genres. An Evening of American Acoustic Music is a spirited romp across the American musical landscape. David Bromberg and this talented group of musicians and singers create a journey that leaves little of that rich landscape untouched. Chicago and Delta Blues, Bluegrass, Country, Folk, Traditional, old time fiddle tunes, flat picking and finger picking guitar classics and a wealth of true Americana. The David Bromberg Quartet, Angel Band and Tom Rush combine to create a truly unique musical experience in this rare opportunity to see and hear so much talent on one stage. Rush appeared here last winter as he celebrated his birthday and over 45 years of making music. He performed at Schooner Wharf (the only time I've ever seen SWB impose a cover charge), and at Pepe's on Caroline St. Bromberg, to my knowledge, never appeared in Key West before. Tickets are available at KeysTix for this one night only performance, almost sure to be a sell-out. Prices range from $30 to $50, depending on seating location, plus tax. Payback Promotions was formed after Captain Rick sold his bait & tackle shop at the foot of Margaret St several years ago. His events always include a fundraising element for one or more local nonprofit organizations. In the past two years, Dostal organized a "NailBangers Convention", a competition for tradespeople to demonstrate prowess with the tools of their trade and with prizes donated by local businesses. The event raised money for the Boys and Girls Club of Key West. The Bromberg - Rush show came about after it became necessary for another promoter to cancel a planned Key West Music Festival at Fort Zachary Taylor that same weekend due to an illness. Captain Rick stepped in and quickly organized the KWHS performance with the two performers. Rush had been scheduled to appear at the music festival, and Bromberg was looking for an opportunity to do a show in Key West at the same time. You'll not want to miss this unique show. I believe that it's possible that aisle-dancing may suddenly break out.